Map of Bedouin Land Grab in the Negev. 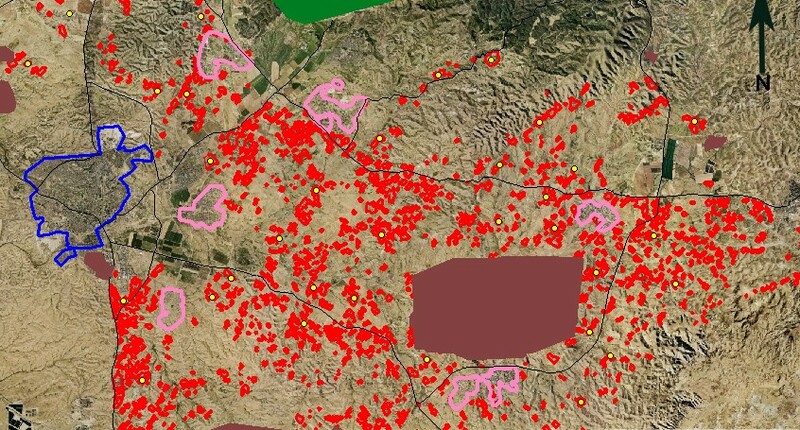 The red dots on the map indicate the areas of Bedouin settlement in the Negev. JERUSALEM – There is an ownership race between Arabs and Jews in the land of Israel that is not limited to the territories of Judea and Samaria, and time is of the essence. This was the focus of discussion at a recent meeting in a private home organized by Regavim, which defines itself as a "social movement established to promote a Jewish Zionist agenda for the state of Israel." As stated in Regavim literature, "Israel is losing its hold on the Jewish people's lands," including in the "very heart" of the country. In the Negev, for instance, the Bedouin now claim more than 200,000 acres – an area 16 times the size of Tel Aviv, explained Ari Briggs, director of Regavim's international department. The Bedouin in the Negev "don't live in tents anymore. Tents are a façade for further building," which is often done on JNF [Jewish National Fund] land, he said. "Many of these people... have been followed leaving in their Mercedes-Benzes and going to their mansions," which, according to Briggs, house polygamous families. Although illegal in Israel, several are "importing wives from Jordan, Syria, Lebanon...and wherever they can get them," and they have tens of children. Unlike decades ago, "today, less than one per cent of Bedouin children serve in the army." He also noted the "Islamification" of the Bedouin community, whose population "doubles approximately every 15 years." According to aerial photography maps provided by Regavim, most of these areas were empty until recently, contrary to claims by the Bedouin settlers that they had been living there for decades or for centuries. Briggs mentioned, among other examples, a new Arab settlement of Dahmash situated just five miles outside of Tel Aviv, which claims to be a long-time Palestinian village. "It's happening all over the place," he said. "They're aiming at the bedrock of Zionism. It's a silent conquest." Those aiming to conquer Jewish land have resorted to destructive behaviour, including "agricultural crime and theft, extortion through violence and threats, hooliganism in the streets, malls and entertainment centres and environmental pollution." Briggs blames the situation on a "hesitant Israeli leadership and the bound hands of the enforcement authorities." National Union MK Dr. Aryeh Eldad addressed the crowd, stressing that the issue is "not a territorial conflict" between two nations fighting over a piece of land. Those attempting to solve the Arab-Israeli conflict have been misled into thinking that the solution would be to divide the land, he said. "The Churchill White Paper of 1922 was the first example. He gave three quarters to the Arabs and he didn't solve the problem," and each attempt to divide the land has resulted in further bloodshed. "[As a medical doctor], I don't know how to cure diabetes, but I can treat it in order to contain it. We can contain the conflict, reduce bloodshed, treat it symptomatically...and one of the symptoms is the Arabs' huge appetite for the land." He cited the establishment of "25 new Arab settlements in the centre of the country in daylight, not underground...and building every day in every open piece of land." The government is doing practically nothing about it, Eldad said; there are court orders against illegal settlements, but the only ones being acted upon are Jewish settlements in Judea and Samaria. "There are huge areas of the country where this race is happening every day. We need pressure, exactly what the left was doing for 25 years," he stated, pointing to "Peace Now and other left-wing groups funded by the European Union, New Israel Fund, etc. They know how to do it. NIF is a powerful tool; we need to counterbalance it." To this end, Regavim has been gathering data by conducting field surveys, as well as documenting and recording the status of land all over Israel, checking the actions of the state authorities, taking legal action against building and environment violations, drafting and promoting recommendations to Israel's decision makers, producing and publishing public reports, and advocating in parliament and internationally to promote Israel's national interests. The organization has made substantial achievements, including, for example, a precedential ruling ordering the Abu Basma Regional Council to demolish 65 houses illegally built in the Negev within a year. Notwithstanding the challenges, "we will solve this," Briggs asserted.